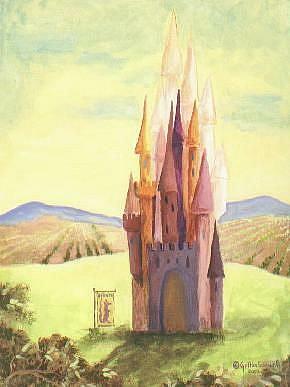 A fairy tale castle in front of bean and tomato fields. This image is available as a matted print (11" x 14" outside dimension) for $19 plus $4 shipping, and a notecard (packaged with an envelope) for $3 each or 4 cards for $10. Please email the artist at queenofbugs@yahoo.com to purchase. Thanks!